In addition to providing specific Microsoft Office Training, EasierThan Business Software offer support for Word, Excel, Powerpoint, Access and Outlook including set-up, advice, templates, mail merging and other ad-hoc queries or issues. With experience of working with Microsoft Office since it was first created, we can provide fast turnaround support for the full Office suite, and as can be seen in the case studies below, no job is too small. Why not Contact Us to discuss your needs. 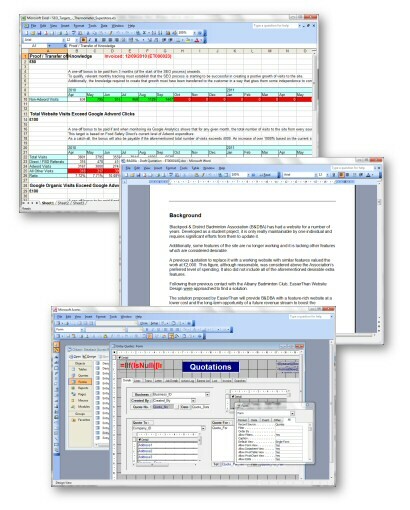 An existing customer, Centurion Blast Cleaning Ltd asked us to set up an MS Excel template to replicate a paper-based form exactly. With preset values and drop down selection boxes, the process of recording the data was speeded up, whilst making it an electronic copy saved on required filing space. When they got a new email for their website, J C Joinery Ltd called us in to set-up the new email account in Outlook and verify it was working correctly. Wyre Wrought Iron had been struggling for a while to figure out why they couldn't open PDF files despite re-installing Adobe Acrobat Reader several times. More of a niggle than a major issue, but the cost of our service meant a call didn't break the bank. After completing a few other tasks for them, Patersons Solicitors asked us to alter a couple of existing MS Word mail merge templates, adding new prompts for information and altering the layouts slightly. We also converted a static document into a merged template from their database system.